The S1000 sub is designed for anti-submarine and anti-ship warfare, reconnaissance missions, and transportation of up to 12 troops. It is 56.2 meters long, has a top speed of 14 knots and is equipped with a new fuel cell-powered Air Independent Propulsion (AIP) system developed by the Italian firm. Designed primarily for exports to third countries, the new submarine will feature an impressive array of weaponry, including Italian heavyweight, wire-guided Black Shark torpedoes and the Russian Club-S cruise missile system capable of hitting underwater, surface and land targets. Promoted by ITALIAN MoD, the cooperation between FINCANTIERI Naval Vessel Business Unit and Russian Partner State-Owned Enterprise Central Design Bureau For Marine Engineering “RUBIN” (under the aegis of Russian Federal State Unitary Enterprise “ROSOBORONEXPORT“), resulted in the S1000 design, which have been designed on the basis of the most cost-effective equipments of both Countries. In October 2006 Russia and Italy presented a mock-up model of a new-generation diesel submarine at an international arms show in France. The project of submarine S1000 raised interest among the participants and visitors of the international exhibition in Paris "Euronaval-2006". The S1000, a 1,000-ton diesel submarine, is a joint project of Russian submarine-builder Rubin and Italian Fincantieri launched in 2004. The idea of creating a joint Russian-Italian submarine emerged in the late 1990s. The Italian shipbuilding company presented a mockup in 2008, at the 21st International Naval Defense and Maritime Exhibition and at the Conference Euronaval 2008. 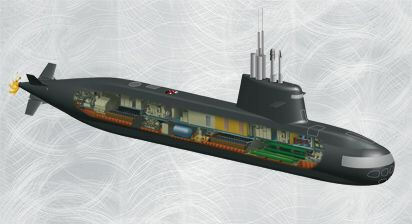 In 2012 Russia and Italy revisited the project of S1000 non-nuclear submarine. The project was frozen four years earlier. This small submarine was designed specifically for exports to the third world countries - Egypt, Morocco and others. According reports in 2012, there would be only 20, not 50 percent of Russian components in the new submarine. However, Russia will be responsible for the promotion of the submarine on the market. The project will become less expensive by abandoning the use of Russia-designed Club missiles underwater launch systems. The price of the future S-1000 is not unveiled but industry experts say that it won’t exceed $120 million-150 million per unit. This price even together with the costs of maintenance and crew training makes the submarine affordable even for relatively poor countries. It was assumed that a small non-nuclear sub would operate in warm waters, near islands and in shallow waters. It was originally believed that the construction of S1000 submarines would be Italy's prerogative. The time for the development of technical documentation and the construction of the lead ship was limited to 48 months from the signing of the first contract. Neither the Italian nor the Russian navies intend to pass S1000 submarines into service. Russia will not be able to use such subs due to the geographical position of the country. Russia is washed by cold seas only. "Our key product in this global market segment is the Project 636 submarine, which is the current bestseller. But we are also promoting the new Amur-1500 submarine,” said Rosoboronexport head Anatoly Isaykin in January 2013. “This is not a replacement for Project 636; it is an entirely new submarine that we will be promoting in parallel with Project 636. The Amur-1500 will also be in demand from international buyers, as it will be offered in different versions — including a version with an air-independent propulsion system that is becoming increasingly popular in the naval market,” Isaykin said. The Italian-Russian project to build a new generation small submarine was suspended because of the "political situation" following Western sanctions on Russia over the Ukraine crisis, Itar-Tass news agency reported 25 July 2014. "To our regret, due to the well-known political situation this project has been suspended," Itar-Tass quoted Igor Vilnit, the head of Rubin's Central Design Bureau for Marine Engineering, as saying.